Chocolate and bacon are two foods that most of us typically eat at completely different times of day. I had never thought of combining them until a reader mentioned eating it at a cooking school. It sounded like a fun experiment to do with the kids (they are used to my crazy concoctions), and it was surprisingly REALLY good! At first, our taste buds were confused. Was it sweet? Salty? Then came the second bite, and we were sold. From now on, forget healthy versions of pie or cake for birthdays. It will be chocolate-covered bacon around here! This is certainly not an everyday recipe, but it makes an excellent and unusual treat for special occasions. Making chocolate-covered bacon couldn’t be easier. Just cook the bacon and set it aside to cool. Next, melt the chocolate in a double boiler. If the chocolate is too thick for easy dipping, stir in a tablespoon or two of the bacon drippings to thin it out. Then dip the bacon in the chocolate one piece at a time, shaking it a little to let the excess chocolate drip off. The technique that worked best for me was to hold onto one end of the bacon and use a spoon to scoop the chocolate over the bacon. I used these semi-sweet chocolate chips for this recipe. I liked the combination of slightly sweet with the saltiness of the bacon. Feel free to use whatever chocolate you like though (or even homemade chocolate). 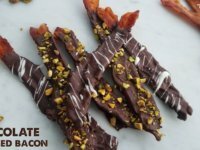 You could even make smaller, appetizer-sized chocolate-covered bacon. Just cut the cooked bacon strips into quarters before dipping in chocolate. If you want to fancy your bacon up a little you can sprinkle it with chopped pistachios or drizzle it with a little melted cocoa butter. (Check out the photos in this article for more decorating inspiration.) Let it cool to set the chocolate and that’s all there is to it! I know it sounds a little bizarre, but give it a try. It may just become a new favorite! Melt the chocolate in a double boiler, stirring occasionally until melted. If the chocolate seems to be too thick for easy dipping, stir in 1 tablespoon of coconut oil or bacon drippings to thin it out. Hold onto one end of a strip of bacon and coat in chocolate, using a spoon to scoop the chocolate over the bacon if necessary. Gently shake the bacon to allow the excess chocolate to drip off. Place the chocolate covered bacon on a wax paper lined baking sheet and repeat until all the bacon strips are dipped. Drizzle with melted cocoa butter or sprinkle with chopped pistachios if desired. Put in the refrigerator until the chocolate hardens and enjoy. If there are any leftovers store them in a sealed container in the refrigerator. Ever had chocolate-covered bacon? If not, what unusual foods have you mixed that turned out great? Tell me below!